In the West today, over 90% of tea consumed is "Broken Black Tea", from India, harvested from the native Camellia sinensis var. assamica plant. This is a direct connection to early efforts of British growers in India trying to duplicate their favourite Chinese beverage using early Industrial Revolution methods of production. These early efforts contributed to the high profits that fueled the British Empire in the 18th and 19th centuries - and shaped world history in the process. Chinese tea from the Camellia sinensis var. sinensis plant has a lower yield than its Indian cousin, a more refined complexity and lower caffeine levels. Manufacturing high quality Chinese teas remains a laborious process of hand-picking and processing whole leaves to retain the full flavor of the tea leaf. Through the Tang, Song, Ming and Qing dynasties and into our modern age, the Chinese love and respect for nature, combined with the continual development of new growing and processing techniques has given us the refined and high quality teas we enjoy today. With the resurgence of the Chinese economy and growth of the Chinese tea industry, discerning tea drinkers in the West are re-discovering the New World of Chinese teas which provide high quality, variety, delicacy, depth and complexity of flavor and aroma. One Plant - Thousands Of Teas! Believe it or not, all tea is made from one plant, known as Camellia sinensis. It is an evergreen shrub that can grow into a small tree. The Camellia sinensis sinensis sub-species is native to Southeast China. The plants can live for up to 100 years or more and the leaves are harvested year round. Another sub-species called Camellia sinensis assamica is native to India and all tea consumed in the world comes from these two plants. Warm up the teapot by filling with boiling water and allowing to sit. This will reduce temperature shift inside the teapot which can affect the flavour of tea. Pour boiling water on the strainer and fill the teacups to sterilize and warm them. Remember, you are serving “food” so you should practice good food handling technique. This is a courtesy to your guests and they will appreciate the care you take for their enjoyment and pleasure. Otherwise, always keep your tea making area and equipment scrupulously clean. Your equipment should also be organized so things are where you expect them to be when you reach for them. This improves your technique and cuts down on accidents and breakage. Empty the teapot of the warming water, place the measured amount of tea (per the guidelines above) in the teapot and fill with the proper temperature water, allowing the water to overflow the top of the teapot until the bubbles disappear and the water runs clear. Replace the lid and immediately pour off the water (or longer if using compressed tea), then tilt the lid slightly open on the teapot. This tilting allows the heat in the teapot to escape and not “cook” the leaves, but retain their aroma. For beginners, I recommend pouring the tea from the teapot into a small pitcher (or any glass or porcelain cup with a lid) before serving the tea in teacups. You'll see, this makes everything easier at the beginning. Fill the teapot until the water overflows the top. Place the lid on the teapot and count 6 seconds (or whatever time scale you are using) while slowly pouring a little hot water over the teapot for few seconds which ensures an even brewing temperature inside the teapot. At the end of the count, pour the tea into the pitcher, place the lid on the pitcher and tilt the lid on the teapot. Empty the teacups (using the tongs of course so as not to touch them) and serve the tea. Remove the leaves and rinse your teapot and lid with hot water and place in the open air with the lid off to allow to dry. Tea is best made with a dry pot and this also allows the oils to set in the clay. Rinse the rest of your tools and allow to air dry. If you find that the tea you have been making might still have some brews left when you finish, you can keep the leaves right in the teapot with the lid closed for up to 12 hours. Any longer might create moulding which could get into the clay and ruin the teapot. When you're ready to make more tea, just pick up where you left off. The first brew time can be a couple seconds less than what it might normally be since the tea concentrates somewhat while it has been sitting. Appreciating tea is as complex and rewarding as appreciating fine wine, but you'd hardly know it given the bags of weak tea leaves that liberally adorn supermarket shelves. In China, tea's homeland, varieties of the leaf have inherited names of fabled locations, mystic qualities, distinguished individuals and, of course, their own share of sayings and proverbs.“The more appealing a *pu'er* looks, the more inferior it will taste. The more unappealing a *pu'er* looks, the better it will taste.” This oft-quoted axiom hints at the **mass of contradictory information that confronts the tea neophyte**, not to mention when words like “unfermented,” “flushes,” “oxidized,” “tannin” and “deep” get added to the mix. 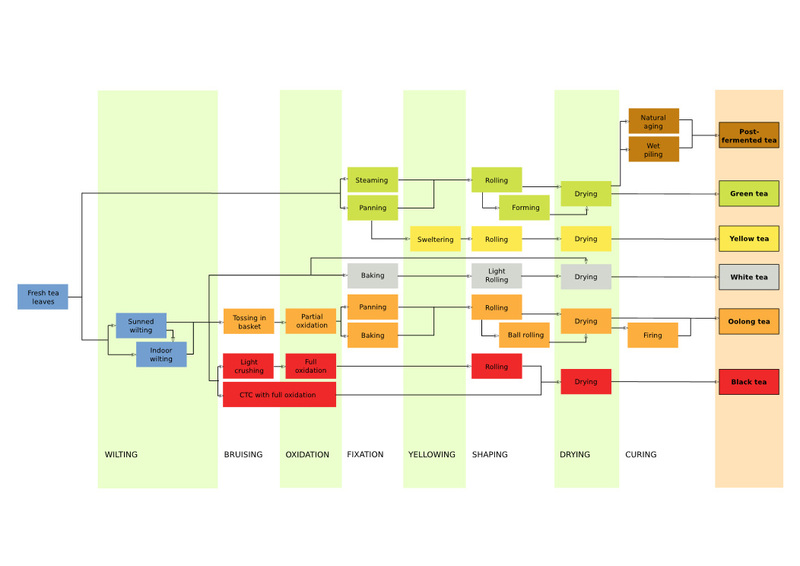 Crucial in the tea world and in tea taste is the fermentation (or oxidization) of a tea. A fermented or oxidized tea is picked and then encouraged to "age" by either being kept in closely monitored humid conditions, or by having certain bacteria or molds introduced. Both methods of **fermentation cause the leaves to develop tannins and become smoother in taste** while also diminishing potent beneficial compounds like antioxidants. Black or fermented *pu'er* from Yunnan are the most famous examples of fermented tea. **Pu'er also lose much of their stimulant forces and caffeine during fermentation. ** The long fermentation periods of *pu'ers* also result in many different vintages and tastes from the same leaf. By contrast, unfermented teas do not go through this period of aging and therefore maintain many of their natural flavors and bitter tangs. Most often, unfermented whites, yellows and greens are simply picked and dried before being sold for consumption. The period from harvesting to arrival on the shelf is often only a matter of days. Whites, yellows and greens are considered unfermented teas and should be consumed within 18 months of picking and kept away from odors. **If one is looking for maximum health benefit from a cup of tea, then the antioxidant-packed unfermented teas are the way to go. ** They're widely touted to help everything from reducing blood pressure, weight, the risks of cardiovascular diseases, glaucoma and cancer to boosting the immune system. **Tieguanyin**, a tea particularly popular in the south, is a semi-fermented tea–technically a 'blue' tea. Neither green (unfermented) nor black (fermented), 'blues' or oolongs are more complex and fragrant. *Tieguanyins* are produced mainly in Fujian and are gently roasted to give them a hint of strength. Among the most recognized unfermented greens are *longjing*, *biluochun* , *badashan* unfermented *pu'er*, *huangshan maofeng*, *molihua*, *juhua* and *baihaoyinzhen*. China’s most famous green tea, **longjing**, is grown around Hangzhou and has seven sub-varieties and seven grades. *Longjings* are known for their light grassy taste and sweet finish. Shaped like pine needles, legitimate *longjings* sell out quickly after the spring harvest in March. Originating in Jiangsu province, **biluochun** ("green snail spring") offers up a more robust green taste, with tightly rolled leaves that benefit from a slight roasting. Grown throughout China, spring and summer harvests are both good bets. **Badashan** unfermented *pu'er* offers one of the best examples of a dark *pu'er* from the famed tea forests of Menghai county in southern Yunnan province. Musty to the nose, it finishes smooth in the throat with an earthiness and a clear tawny color. Great for digestion, the spring harvest teas from Menghai and Bada are good introductory teas to the *pu'er* world. There are typically just three harvests annually, and the March harvest has the best reputation. **Huangshan maofeng** ("Yellow Mountain Fur Peak") is a refreshing green tea from rural Anhui province and true spring vintages are the premier harvests. It often contains a hint of orchid flavor–though today, this often comes by the way of chemical additions. If you enjoy a floral hint to enhance your tea experience, there is the classic green **jasmine** (*molihua*) blend. Though frowned upon by tea purists, it is nearly ubiquitous these days. 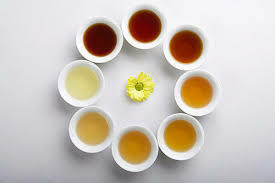 A healthier and equally available option is **chrysanthemum** (*juhua*) green tea, which aids in cooling the body and flushing toxins from the body. Another spring seasonal tea is *baicha*. Although not actually white in color, it's made up of the youngest, most supple tea leaves which are painstakingly clipped with the slit of a fingernail. **Baihaoyinzhen** ("silver needle" tea) from Fujian offers up a classic example of a white, with minuscule hairs still present on the nubile leaves. White teas in particular are lauded for their robust antioxidants, antibacterial compounds and vitamins. Good whites should not be prepared with fully boiled water as the heat kills its taste and subtleties. In the traditional Chinese marriage ceremony, both the bride and groom kneel in front of their parents and serve them tea. That is a way to express their gratitude. In front of their parents, it is a practice for the married couple to say, "Thank you for bringing us up. Now we are getting married. We owe it all to you." The parents will usually drink a small portion of the tea and then give them a red envelope (gift money), which symbolizes good luck. Another variant is for the to-be daughter-in-law to serve tea to her to-be parents-in-law, symbolizing that she is to become a part of the latter's family. The tea ceremony during weddings also serves as a means for both parties in the wedding to meet with members of the other family. As Chinese families can be rather extended, one or two hundred people, it is entirely possible during a courtship to not have been introduced to someone. This was particularly true in older generations where the patriarch may have had more than one wife and not all family members were always on good terms. As such, during the tea ceremony, the couple would serve tea to all family members and call them by their official title. Drinking the tea symbolized acceptance into the family. Refusal to drink would symbolize opposition to the wedding and is quite unheard of since it would result in a loss of "face". Older relations so introduced would give a red envelope (gift pocket money) to the matrimonial couple while the couple would be expected to give a red envelope to younger, unmarried relations.